I was typing I'm ready for the weekend to start and I realized it has already started. I'm ready to ignore that and get some sleep. But before I say a warm hello to Morpheus I'm ready to keep my promise. For the last few weeks, I have been posting very bright and colorful planner goodies. The summer, the warmth the chirping birds got to me and I have been feeling like swirling around in a bright floral gown for a while now. I consciously chose to stay away from colors today. A little break won't do much harm besides I had a pretty cool idea. Well, I think it's cool, which means that its coolness is quite questionable. I'll let you be a judge. I love love love chalkboards. It brings up the child in me. A few weeks ago I got myself some chalkboard paint and I've been turning everything around me from home decor to art supplies into chalkboards. I am currently the proud owner of a chalkboard coffee tray, chalkboard wall calendar, and a very chalkboard fabulous pantry shelf. Unless someone takes this paint out of my hands the madness will continue. 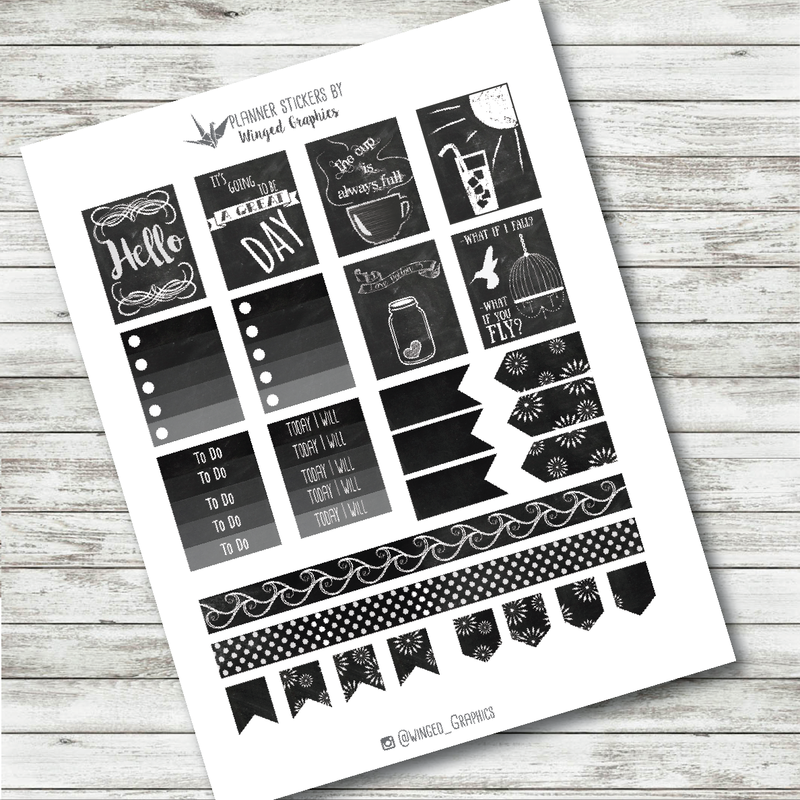 On this madly chalky mode, I decided to create a chalkboard ticket set for Erin Condren life planners. It's a bit dark but my inner Morticia Addams is very pleased. Optional : support me by liking my Etsy store https://www.etsy.com/shop/WingedGraphics or following my Instagram @Winged_Graphics or just tag me in your planner pics. I’d love to see them used in your pretty layouts.